Last Tuesday at the Final Cut SuperMeet the world was given a sneak peek at Apple’s newest iteration of Final Cut Pro: Final Cut Pro X. I wasn’t there, but I’ve watched some of the videos floating around online of the presentation as well as read some write-ups and reactions by people who were there. Naturally, as the internet thrives on the needless multiplication of opinions, I’ve decided to add some of my own thoughts, musings and the like to the overall discussion. First, the context. Final Cut Pro has probably the largest installed user base among professional non-linear editors, surpassing Avid and Premiere. (and Vegas) However, it hasn’t seen an update since 2009, and in the meantime the competition has introduced a large array of compelling features that, to be honest, make the current version of Final Cut Pro (FCP7) feel ancient. Chief among them is 64bit, (FCP7 is 32) native handling in the same sequence of differing formats of media, etc. For example, Adobe’s Premiere Pro CS5 has the Mercury Playback Engine, which, being 64bit, leverages all the systems RAM and processing cores to essentially allow you to never have to render, which is definitely a nice feature. FCP7, still being stuck in 32bit land, bangs up against the 4GB RAM ceiling, leaving you with a largely idle computer and lots of ugly red and yellow render lines above your clips, even with seemingly simple tasks like color correction, effects, etc. Thus, in many respects, Final Cut Pro X is playing catch-up. On to the SuperMeet. SuperMeet is a gathering of video professionals who also use Final Cut Pro on a daily basis. Thus, this was essentially an “All In” move for Apple to give the sneak peek to this type of audience, apropos given its Vegas setting. It wasn’t until Friday night that I was able to watch the keynote. It was equally interesting to hear the crowd’s reaction- sometimes extremely enthusiastic, with cheering, whistling and applause, sometimes ambivalent with a few half-hearted claps and the presenter attempting to drum up energy, and sometimes downright silent, with the build-up to an expected excitement followed by the proverbial crickets. I think a lot of the fears were put aside with the price- at $299, it’s affordable enough to get it and try it out, just-in-case-it-might-possibly-be-good. To people who don’t use this kind of software on a day to day basis, it can be difficult to understand the potential excitement or disappointment. Significant changes to workflow, user interface, media handling, content management, etc., can present either incredible opportunities or incredible frustrations, and in many cases both simultaneously. The pro video industry doesn’t stop so you have time to learn new software, or even so you can learn how the software you are used to using day-in and day-out has changed. Thus, the mixed bag of reactions and emotions present in the presentation. So much for the context. Now for unsolicited opinions! The 64-bit nature of FCPX was as unsurprising at it was necessary. The last version of Final Cut Pro (FCP7) was stuck in 32-bit land, and honestly felt like a rather half-hearted release. The software hasn’t significantly changed since FCP1. However, FCPX is, according to Apple, a complete rewrite of the code. This is a pretty bold move by Apple, in that a complete re-write is not easy (or quick) to pull off. One advantage of a complete re-write is that all the legacy code that is floating around in FCP7 is gone. (Something I wish Adobe would do with Photoshop…) Everyone who has seen FCPX in action indicates that it is fast, and fast definitely counts. The 64-bit nature of FCPX is exciting to me because of the sheer amount of power in my computer that can now be leveraged. Right now, I have 8 processing cores and 10GB of RAM. FCP7 can only use 4GB of that RAM, meaning that more than half of the power available in sitting there idling. FCPX also uses spare processing cycles to render in the background, which means that having to render in the timeline will be largely a problem of the past. In the demo, one of the render bars showed up above a clip, and was gone in about 1 second, while the presenter was editing. That’s exciting, and the crowd liked it as well. The Magnetic Timeline looked very cool, and I think was one of the more compelling features demonstrated. In FCP7, if you want to re-arrange clips without damaging the edits before and after the change, you have to do this awkward little dance where you move everything afterwards a little further down, place your clip in its new spot, and then bring everything you initially moved back. With this kind of workflow, it can be easy to get audio out of sync, forget to actually move everything you wanted, not move everything enough and have to do it again, etc. In other words, it’s tedious and inefficient. The Magnetic Timeline largely seems to mitigate this. Along with the Magnetic Timeline, the ability to link clips and audio together (Clip Connection) was a pretty compelling feature. Again, in FCP7 the only tracks you can link together are the primary video and primary audio. Once you start adding additional audio tracks, overlaying additional edits, etc., the timeline can get pretty unruly. If you need to move a clip with a bunch of additional audio and additional video clips, you have to make sure to select them all and then move them. In this workflow, it can be extremely easy to accidentally miss something. Now, however, you can link any number of of clips and audio together, so when you move the clip you move all the things linked to it. You can even group them all into what looks like a single clip on the timeline, (Compound Clips) to reduce visual clutter. You can then either make edits on that group or double click and dig down into the group and make edits that way. The media management has been radically reworked. In FCP7 there’s not a very robust system to label and find media- basically, you can group different clips into bins. In FCPX there is now something called Range-Based Keywording. Basically, you can choose a range within any clip and add keywords to it. You can apparently make any number of these range-labels, even on the same clip. For example, if you had a shot of a car driving into the sunset, you could select the portion where the car drives into the sunset, add the keywords you want to it, and then when you open up the group of shots labeled ‘sunset’ or whatever you call it, all those clips are there, rather than having to label a bunch of bins and having to copy and paste the same clip into multiple bins. For some people I’m sure this is a mixed-bag, but I think it’s far more intuitive. For me, I would rather generate groups of clips while I am looking at my media rather than trying to make up bins before and then either forcing clips into them or having to copy and paste and remember where they go. The auditioning feature was fairly impressive. This allows you to create a group of multiple edits on the timeline in the same spot without having to stack and turn tracks on an off like you have to do in FCP7. For example, let’s say you have a closing shot for your video, and have 4 different shots that could work but need a sign-off from someone else before you make the final edit. In FCP7 you’d have to stack up the four different shots on top of each other, and then turn the different tracks on or off. Naturally, you’d either have to copy the audio and turn it on or off as well, or perhaps just make four different sequences. Not very efficient. In FCPX you can set up the four shots in an audition group. You simply hover over the audition group and can choose which shot you want to playback. The timeline reorganizes itself to the shot you are auditioning. Pretty cool. There’s a lot of comments on some of the write-ups of FCPX that it is merely an iMovie Pro. Granted, FCPX does borrow a lot of features and functions from iMovie. However, this isn’t necessarily a bad thing. Simply because some of the things from iMovie show up in FCP doesn’t mean they’re dumbed-down. For example, FCPX uses the filmstrip feature of iMovie. Basically, a specified amount of thumbnails are generated for your clip, and you can then cursor-over the filmstrip to see a real-time preview of the media in the clip. Some people really don’t like this, and because it’s something that first showed up in iMovie, is billed as a dumbing down. Right now in FCP7, there are no thumbnails. You see a little icon that indicates something is a clip with the clip’s name next to it. The only way to see what’s in it is to open it in the viewer and then either play it back or scrub through it. If you want to look at another clip, you have to do the same thing. Want to see that previous clip again? Click on it again and repeat. Oops, want to see the other one again? Repeat the process. Now, however, if you have keyworded multiple clips, you have an instant preview of what media you have at a glance, and can easily scrub through it to see what you might want to use. To me that isn’t dumbed-down; it’s intuitive and efficient. One thing I have noticed is that many of the comparisons to iMovie are about things that FCPX does to facilitate the reduction of needless complexity. A ‘pro’ application is not necessarily needlessly complex. Sure, anything with robust tools for a specific task will have some level of necessary complexity to enable as much creativity as possible, but with editing there are a lot of workflow functions that are better off without the necessity of editing them. For example, in FCPX the primary video and audio are ‘permanently’ linked. There’s no way to accidentally unlink them, as you can quite easily do in FCP7. In probably 90% of the cases, you want them to always be synced. Having to worry about them not being in sync (as discussed above in regards to clip linking) is needless complexity in the 90% of cases. For example, in FCP7 the primary video and audio are on two separate tracks. Once you add additional audio, you now have another audio track to keep track of, even though in 90% of the cases you are going to keep the primary audio and video linked. In FCPX, the primary audio waveform shows up in the primary video clip. You have the ability to dig down into the clip and adjust the audio if you want to, but if in most cases you are not going to, why have the needless complexity? That just adds time and inefficiency to a workflow. Part of using professional applications is maximizing the workflow. If the software can do that in ways in which needless complexity is reduced, and if those ways have been hammered out in software that isn’t a professional app, why not have it? Sometimes I get the feeling that some people only think an application is ‘pro’ if it is maddeningly complex. …So does the new FCP debut a dozen never-before-seen features? Maybe not. But the magic of software comes in allowing people to do complicated things in the most simple manner possible. That, more than anything, is what Apple is good at, and that’s why folks are over-the-top about the potential of FCP X. Something else I have noticed is that a lot of the write-ups and comments on FCPX are from video pros who work in larger production environments. However, the pro video market is quickly becoming larger than that. In the past, video production was mostly the domain of studios and production houses. The workflow of non-linear-editing reflects this, as there are applications for editing, motion graphics, audio, color correction, and media distribution. However, the greater affordability of high-quality cameras and the advent of DSLR and HDSLR video has meant that rather than video production being the purview of large production houses, more and more it is becoming a smaller endeavor, often a one-person enterprise. Thus, the same person is shooting, editing, color correcting, audio engineering, making the graphics and distributing the media. In such an environment, the traditional segmenting of applications and functions makes less and less sense. Apple looks to be betting that the future of video is going to become smaller in scale in a sense- more and more of the people who are going to be using this type of application are going to be in smaller scale production environments. It’s really only been a matter of time. With DSLRs and HDSLRs becoming less and less expensive with more and more video capabilities, the entry point for making films and videos is being lowered. (Note that this does not necessarily mean that the quality of content being created is automatically also lower- check out some of the DSLR films being created on Vimeo for a taste of what people with lots of creativity and talent are doing. After all, feature length films are not the only type of films.) The internet coming into its own as a distribution format gives a much wider berth for content to be disseminated. These factors alone considered, Apple’s bet seems a safe one. In many of the comments I have seen, some who bill themselves as video professionals have been lamenting that with FCPX is Apple trying to reach only this new and growing semi-pro market. The question is if FCPX will still be available for use within the traditional production environments. Who knows? 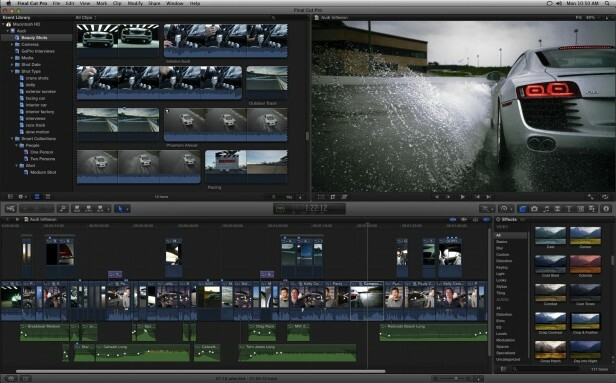 The sneak peek showed relatively little in the realm of FCPX’s complete feature set. Rather, it seems to me to have been a chance for Apple to show some of the things that they think represent a way of re-thinking the whole process of non-linear editing. Time will tell if Apple’s newest iteration of Final Cut Pro actually does this, as well as if people within the industry will embrace it.